For those of you not familiar with it, The Spark is a Local History and Arts Review magazine. 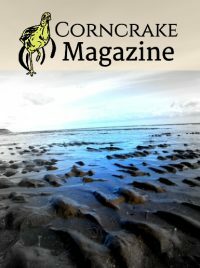 It is published once a year in April and is distributed in seven counties of the North-West: Donegal, Tyrone, Monaghan, Cavan, Fermanagh, Leitrim and north Sligo. The next issue (No. 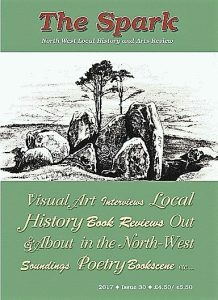 30) has almost 30 articles and features that cover a wide spectrum of interests – local history, interviews, visual art and poetry as well as book reviews and other matters about books and publishing. Arthur Parry – the boy who went to war; Irish Neutrality – Sacred Cow or Myth? ; Enniskillen and the Spanish Civil War; and Memories of the S.L.N.C.R. (Sligo Leitrim and Northern Counties Railway). On the more literary and arts side there is a short piece on W.F. Marshall ‘the bard of Tyrone.’ Ted McCarthy has a beautifully written short piece on a personal connection with Robert Zimmerman (Bob Dylan) and Patrick Kavanagh. Bobby Hanvey (the Ramblin’ Man of Downtown radio for many years) and photographer of many famous people, talks to Michael McPhillips. Photographs of Heaney, Friel, De Valera (in coffin) and Lord Brookeborough, etc. are included. Prof. Frank Shovlin talks about the writings of John McGahern. Shovlin was once taught by McGahern in Galway University. It is a very insightful interview (by Melanie Ward) about McGahern and much else to do with writing. Mary Montague, a poet born in Ederney, has a pageful of poems. Mary has her third collection coming out soon. She has been translated into at least three other languages. Two final year students from South-West College show their paintings, and besides all that there are other bits and pieces to whet the historical and artistic appetites. The Spark is on sale in all the main towns of those seven counties, and many smaller towns too.